Are we able to influence our level of happiness? There is evidence to suggest that we can. By using the principle of practical metacognition, each of us has the ability to achieve a happier state of being and make our lives significantly better in the process. 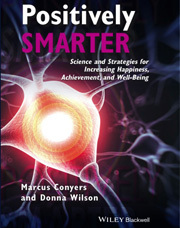 Marcus created the concept of practical metacognition for our recently published book, Positively Smarter: Science and Strategies for Increasing Happiness, Achievement, and Well-Being, available from Wiley. In conjunction with that premise, we refute the notion that people’s outlooks and attitudes are largely fixed and unchangeable. In truth, an individual with a pessimistic or optimistic outlook is not born that way. As we explain in the book, our genetic makeup, family background and life experiences are only partially responsible for our outlook on life and our ability to experience and sustain joy. By understanding that there is a strong connection between happiness and success in achieving our personal and professional goals, we can make a conscious decision to optimize this dynamic—i.e., to subjugate negative thoughts and behavior in favor of positive emotions and actions that will allow us to reap tangible rewards. With a positive outlook, we are more likely to work hard, have more effective communication with others, develop better interpersonal relationships, be more productive, solve problems and tap into our creative selves. We have more effective outcomes, and we do, in fact, become progressively smarter. In many of our books and articles, we often speak about the importance of metacognition—i.e., thinking about your thinking with the goal of improving your cognitive processes. Through the use of practical metacognition, we can use cognitive strategies to establish clear intent about what we want to achieve, plan and execute the necessary action steps to realize our intent, and then assess, monitor, and adjust our thoughts accordingly. Compton, W. C., and Hoffman, E. (2013). Positive Psychology: The Science of Happiness and Flourishing (2nd ed.). Belmont, CA: Wadsworth. Lyubomirsky, S. (2007). The How of Happiness: A New Approach to Getting the Life You Want. New York: Penguin.